History - The cabin was built on the Kentucky Building grounds. The cabin had a "shaker roof", along with large rooms and fireplaces. Originally, the front room of the cabin was to be a museum, and the other rooms were to be used by the caretakers. The project failed because of lack of funds and there was no practical way to heat the cabin. The year after it was completed the College Heights Foundation and the Alumni Office moved in. In 1940 the cabin became a faculty residence. 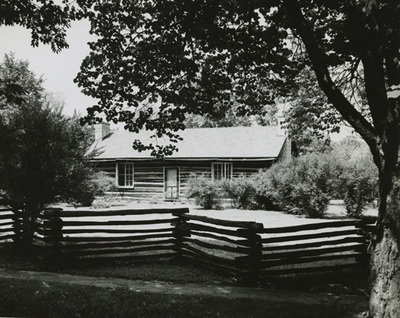 "The pioneer log cabin is only a model of the buildings used in Kentucky in earlier years. It was prepared as a home for the care-taker of the Kentucky Building and gardens, with one room reserved for exhibition purposes. In planning it, those in charge felt that a typical log cabin would be appropriate in the setting of an old-fashioned garden and, at the time, show the people of today the type of building in which our ancestors lived." [Letter from Gayle Carver to L.C. Everard, April 3, 1939] The cabin was constructed of popular logs which were taken near the birthplace of Henry Cherry. In 2004, the cabin was placed on the National Register of Historic Places.